Despite being a teacher, speaking in front of a group of people always filled me with unease. Give me a class of 10-year olds any day, but a room full of adults would fill me with dread. I’m the sort of person that would even go bright red in staff meetings if I had to answer a question! So I, more than anyone, am surprised at the amount of times since having Hugh I have found myself standing up in a room full of people giving a presentation. Maybe because I feel so passionate about undiagnosed families getting the right support it makes it easier to speak with confidence, plus my son Hugh is undoubtedly my specialist subject. Whatever the reason, rather than dread it I’m reaching a stage now where I’m actually enjoying it. My first foray into public speaking came courtesy of Hugh’s paediatrician 5 years ago when she asked me to talk to trainee registrars about life with a medically complex child. PowerPoint of cute photos at the ready, I took the opportunity to explain the challenges faced with a lack of diagnosis and the support and understanding that would make life easier for us, highlighting the importance of SWAN UK. And I’ve been talking about the same thing fairly regularly since. 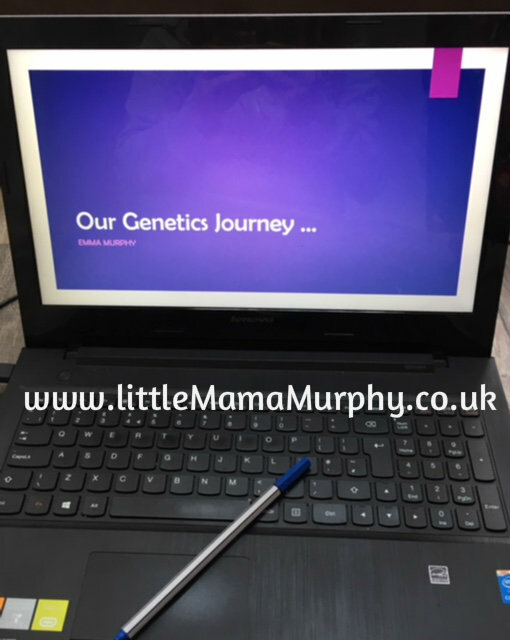 · Not having a diagnosis is relatively common – approximately 6000 children are bornin the UK each year with a syndrome without a name – a genetic condition so rare that it is often impossible to diagnose. · Not having a diagnosis can not only be frightening and isolating but can also prevent or delay access to appropriate services and support. This needs to change – support shouldn’t be dependent on a diagnosis but on need. · This is our child. First and foremost. Whether they are seriously ill, medically complex, developmentally delayed and/or don’t fit neatly into any little box, they are still our children and as parents/carers we often know them best. Please treat them and us with empathy and respect. Plus, all my presentations come with a healthy dose of cute photos to detract from my slightly flushed cheeks and trembling hands. Most recently I have had the honour of presenting as part of Counselling Skills for Genomics module at The University of Birmingham. The course is aimed at NHS staff and is part of an MSc in Genomic Medicine. Again, the key points remain but with an added focus on the importance of having a positive and empathetic relationship with the families involved and remembering that at the centre of everything is the undiagnosed child and that all decisions and discussions should reflect that. I shared some horror stories (both our own and those of friends) and pointed out some of the upsetting words used on letters and in medical appointments to describe our children. I explained how finding out diagnoses by accident in a letter is never a good thing and the importance of honest, open and regular communication. As always, I highlighted the important work being done by SWAN UK to ensure families of undiagnosed children and young people don’t feel alone and in raising both public and professional awareness of undiagnosed genetic conditions and the unique challenges faced by families. This is the second time I’ve presented as part of this module and have been asked to come back again. Maybe I should start calling myself a ‘guest lecturer’, The feedback has been really positive and I gather that they all had lots they could take away from it. The right support for parents/carers of undiagnosed children is vital and I hope that by sharing our story time and again that I will continue to raise awareness and influence and improve the experience of families starting this journey after us.